BeirutMakers present their third design exhibition under the title Command: Commandline, showcasing a variety of locally-developed know-how's for authoring, editing and hybridizing digital and physical media as a mode of design. Set around organizing two exhibitions each year, this winter BeirutMakers invited two independent curators Adham Selim and Dima Hamadeh to join their effort for bringing digital design and fabrication to the fore of discussion over the future of design in Lebanon and the region. The exhibition draws on the notion of the commandline, a software utility upon which many design programs are based, as the key to defining the relationship between the designer and design-object. Relayed as a sequence of orders, this relationship outlines the designer’s newfound agency to make design decisions that are at the same time defined by syntax and material meaning. Juggling; tweaking; zooming in and out; bifurcating; reversing through different commands yields different possibilities for tentative, accidental and playful design-objects. In this exhibition, artifacts and their traces in time such as: materials, tools, machines, techniques, etc. are re-synchronized and condensed into one code/design-object that is not merely a representation of the final artifact, but a performative embodiment of it; a log of instructions that summons it into existence. These design-objects effectively replace a diverse array of material and intellectual apparatuses used for the aesthetic production and evaluation of design artifacts, thus presenting objects that are forms of knowledge: edited, tweaked and deployed in alternative forms. Command: Commandline showcases objects, codes, relations and systems designed by five designers, revealing the various processes, choices, errors, undo's and transfigurations behind the finishedness of the exhibited objects. The exhibition features the latest designs by four members of the BeirutMakers collective: Ahmad Khouja, Guillaume Crédoz, Karim Chaya and Stephanie Bachir. Additionally, world-renowned designer, Janne Kyttanen, will be a special guest of the exhibition. Each designer presents their own interpretation of tool-specific, material-researched and digitally conceptualized objects. Whether a piece of furniture, a lighting fixture or a wearable item, these designs take form, material, tool and technique as their primary site of inquiry to develop a localized take on digital design. In certain instances, such inquiry informs not only the form of the piece but also the very chemical composition of materials involved in its production (Ahmad Khouja). In other cases, it transforms into a series of procedural abstractions where twisting the steel sections of a chair to make it structurally stable, connecting a lamp's rotation with the intensity of the light it emits or smoothing the surface of an eye-wear to match user's facial contour, becomes a regime of design-thought where the designer produces material-specific information rather than objects (Guillaume Crédoz). This also translates in the designs of Janne Kyttanen, who sent his objects to Beirut as codes via internet, and in so doing, questions the object-hood of these objects. On a different scale, Stephanie Bachir mathematically analyzes the human body's surface and turns it into a triangulated surfaces ready to be manufactured out of flat-sheet materials, thus radicalizing couture. This exhibition comes as a timely contribution to the emergent discourse on the future of design in the region, not only as a profession but as a practice that characterizes and redefines all forms of human endeavor. BeirutMakers is an open collective that regroups Architects and Designers brought together by the singularity ot their practice: Digital Fabrication. Ignited by Guillaume Credoz with the support of Beirut Design Week 2015, the collective is constantly growing and gathers confirmed makers like Karim Chaya, Ahmad Khouja, and the younger scene: Kamal Aoun, Charbel Jreijiri, Hadil Ankouny, Stephanie Bashir and Thomas Billas. The Maker movement and Culture has emerged worldwide thanks to the democratization of computer guided machines such as CNC and 3Dprinters. A new breed of creative has been empowered by those machines and is using that potential to answer in new ways to design programs. Bridging the 'over the wall' communication issue between designers and crafts people, the makers have to define all the information necessary for the machine to manufacture the objects, therefore every decision and every issue have to be tackled at design stage. eklekta is hosting an exhibition and market of products and furniture which are markers of this change in the design history. Tables, Chairs, Lamps, Toys, Shelves, leather items, are being re-invented through the digital fabrication process, and will be for sale on the spot. The Designer-Craftsman duo, one drawing ideas and the other one finding the way to manufacture them, has been the rule for a while. Now, a new generation, designs and builds, making it more like the masters craftsmen before Ford's work tasks division. This transition is unfolding now and the Makers are pioneering it. Two themes have been tackled by BeirutMakers: Urban Space and Affordable Design. After their first exhibition at the Souks of Beirut, the Urban space exhibition is held in eklekta's outdoors while the Affordable Design one will be housed in eklekta exhibition space. (See /eklekta folder in Press-release). The 'Power of Nap Addicts' public/outdoor furniture is an extended set of benches, chairs, tables and lounge chairs, that proposes to fight against the car invasion in public space by opposing the calm requiredby public sleepers. All the 'Power of Nap Addicts' pieces are made from recycled material: Recycled aluminum and Concrete Formwork wood. It has been designed to fulfill the design requirements for public furniture: wear and weather resistance, structural test, at an affordable price, to provide municipalities and individuals in developing countries with some hands-on tools to make their public spaces better. Being in control of the full production line, from idea to end of production, gives the makers the ability to harness the cost of their products. The repeatability of the computer driven machines, once the information has been perfectly defined, allow to also take the price constrain as a design factor. The maker movement comes from the democratization of computer driven machines, and it is bringing it to the People. It is now possible to create items with a great design input that was only available to a happy few. That's why this exhibition is not only a show, but also a market where one can actually buy affordable design pieces. The conjunction of the being able to describe forms precisely thanks to the assistance of computers and having access to information driven machine tools has empowered a new kind of creatives. Bridging between designers and craftsmen, a new generation who is more in control of their creation, as they have to organize informations to pilot the machines, and who are conscious of the manufacturing process and requirements are born: the makers. The maker movement is rising in the middleeast and this exhibition is the acknowledgment of this phenomenon. In research of a fulfilling lifestyle more designers wannabees emerge and rely on the skill and experience of expensive craftsmen to complete and realize their designs. Their one-off limited editions of hardly producible; and therefore expensive designs find an output only in expensive galleries dedicated to a very wealthy audience and focus on gaining media’s attention. On the contrary, makers live deep in workshops in contact with the materials. They aim to reveal the true nature of materials and they know that the process from tools, steps and techniques is the way to do it. If the association designer + craftsman produces interesting designs despite a few hick ups, it is interesting to follow what the makers will output. It’s way too easy to describe the maker by opposing it to the couple: designer + craftsman. In reality, the limits are more blurred. A good designer should have practiced all crafts if he/she wants to design properly. At a certain level of complexity like an architect, a designer has to be the one which orchestrates and watches over the concept. He cannot build by himself every part from every trade. If the designer’s lack of know-how creates often unwanted difficulties to the craftsmen that pointlessly increases the production cost, it also sometimes creates interesting new objects. The continuity of presence and control of makers over the creation and manufacturing processes is giving to their design a greater integrity. Taking into account manufacturing processes from early stages of design allows for control over the production cost and the repeatability of the parts. That same way, the intimate relationship with the making as most makers own their computer driven machine tools, gives the makers another relationship to the process such as the ability to share the process and propose, on some designs, to have the user make the final assembly. The journey of a maker from bits to atoms within one design is long. Matter and tools will sanction his/her errors harshly. But to have mastered, on his own, from idea to completion, with an awareness gained by the process, is a well deserved reward. Would the integrated knowledge of manufacturing limit the maker’s imagination (because he early integrates fabrication constraints in his design process), or would he invent at both stages of concept and fabrication by creating new machines and processes? 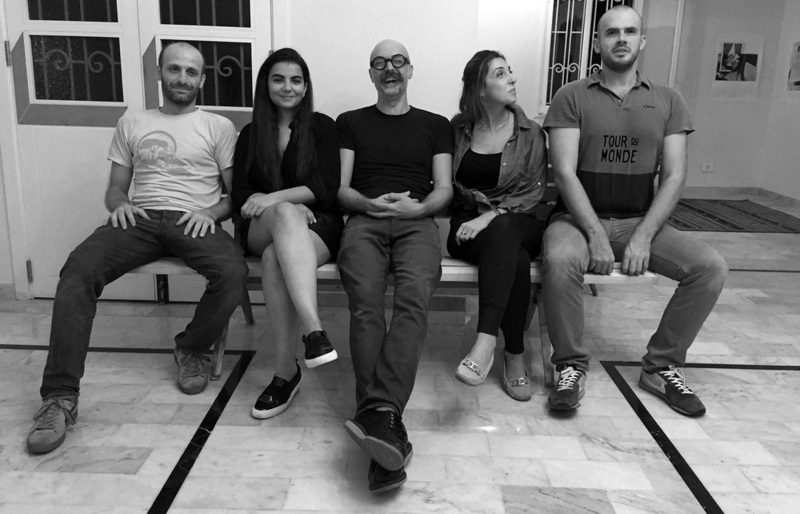 In this exhibition, representing the avantgarde maker movement in Lebanon, confirmed makers such as Karim Chaya, Guillaume Crédoz and Ahmad Khouja are joined by the younger scene: Kamal Aoun, Charbel Jreijini and Hadil Ankouny.